The European Satellite Navigation Competition was established in 2004, and has rewarded the best services, products, and business cases that use satellite navigation in everyday life. AutoAlert uses satellites to provide location information to our customers so they can better manage their vehicles and better manage their jobs. AutoAlert mission is to eradicate paper based job sheets for remote workers. Using paper based job sheets is labour intensive with lots of duplication, especially as more subcontractors get involved in the job. In addition, no one knows what is happening with each job until the job sheet is returned. This leads to stress, anxiety and lots of chasing. It often also leads to delayed or inaccurate invoices as job sheets are returned with difficult to read or missing information. AutoAlert has a massive opportunity to create a social network for blue-collar workers which eradicates the need for paper based job sheets whilst improving the performance and efficiency of companies operating in complex supply chains. We are a small company, however we have already achieved big things with almost 20,000 customers on our platform. With AutoAlert jobs we believe we can acquire many more customers due to the vitality of our platform and huge value in our customers connecting to their own customers and subcontractors and then being able to share the status of their jobs and communicate easily via a desktop, tablet or mobile telephone. Our mission aim is to eradicate paper based job sheets. Millions of job sheets are created each day for remote workers. They give information about what jobs need to be done and are used to get information back about what work was done for each job. Unfortunately, this is a very labour intensive process with lots of duplication, especially as more subcontractors get involved in the process. In addition, no one knows what is happening with the job until the job sheet is returned. This leads to stress, anxiety and lots of chasing. Invoices may also be disputed or delayed when information is missing, difficult to read or inaccurate. AutoAlert jobs resolves these problems by creating a “social network for blue-collar workers” which allows companies to connect to each other, share jobs and then update those jobs on a mobile telephone while the job is being done rather than at the end of the day or week. Prior art in this field is provided by companies such as Oracle and SAP who offer complex Enterprise resource planning (ERP) systems to large organisations. More recently, companies such as GeoOp and vWorkApp have entered the market with more simple work tracking solutions using smart phones. These solutions work well for individual companies but fall down when more than one company is involved in the job as existing applications do not allow companies to connect to each other and share the status of their jobs. AutoAlert is a connected system and works right the way along the supply chain. This means that you can see the status of your jobs which are being completed not just by your own engineers but also the jobs which are being done by your subcontractors. The key components to the system is AutoAlert’s cloud based infrastructure combined with mobile phones and/or GPS tracking devices. Utilising the location of the mobile phone or GPS tracking device enables the key aspects of the job to be updated automatically such as when an engineer is on site. it also helps with health and safety concerns especially when engineers are working on their own and in potential dangerous conditions. AutoAlert uses GPS, CellId and WiFi Location to check the location of the engineers, create location-based alerts and update the status of the job when an engineer arrives or leaves the job site. We prefer CellId to derive location as it is the most readily available source of location and is available at the lowest cost in terms of power. It also provides adequate accuracy for our needs. GPS and WiFi are also used to improve on the accuracy of the location. GPS is pretty ubiquitous and is available in most smartphones and a wide choice of tracking devices. GPS chips are cheap, readily available and well-tested. We are keen to use other location technologies including Galileo as this will likely improve accuracy and reliability. However, we are mostly reliant on their adoption by mobile telephone handset manufacturers. Our target market is growing companies with remote workers. This could include electricians, plumbers, transport and logistics companies and fire and security companies. There are two target markets for AutoAlert Jobs. The first is small but ambitious companies. Bigger than one man bands but without the resources including time and money to invest in more complex systems. In the UK there are almost 35,000 electrician companies with a size of between 10 and 100 employees. There is a similar number of plumbing companies. There are almost 60,000 transport and logistics companies. They can benefit by being able to take on more work, offering a more professional service to their customers and by being able to check the status of their jobs. Competitors to AutoAlert include GeoOp and vWorkApp who offer job scheduling software on smartphones. However, their applications only work internally which means that companies within this market cannot connect to their own customers and subcontractors and share the status of their jobs with their customers and subcontractors without logging in and out of different systems or different accounts, duplication and extra work. At the other end of the spectrum is large national and global companies who have a number of sites and use many subcontractors. Facilities managers at these companies are a particular target as they have a number of small jobs which are sent to their own staff or to subcontractors. They can benefit by being able to check the status of their own jobs and being able to check the status and performance of jobs done by subcontractors. Competitors include ERP systems from the likes of Oracle and SAP. However, again these are focused on individual companies alone, they are also expensive and complex which means these companies cannot force their smaller subcontractors to use the system to provide the status of their jobs. Using paper based job sheets is expensive in terms of administration, duplication, chasing of employees and subcontractors and disputes over invoices. Our customers estimate the cost for each job done using a paper based job sheet is £40 per job. This is about 10% of the value of a typically job. By using AutoAlert, we can eradicate the majority of this cost as there is no more duplication, information is readily available to all interested parties, therefore less chasing of employees and as invoices can be raised automatically and as soon as the job is completed, this means less disputes and quicker payment of invoices. AutoAlert is available on a subscription basis with three pricing plans. A free tier is available for customers who want to update their customers jobs and communicate with their engineer. Our research has shown that this is important as larger companies want their subcontractors to use their system but don’t feel that they can impose extra costs on their subcontractors. If the subcontractor does want to use the platform to create their own jobs for their employees or subcontractors then they can upgrade their subscriptions or by a bundle of job credits for about one euro per job. The last tier includes a GPS tracking device which can be used to provide reports about vehicle movements, working times, driving times etc. Bespoke solutions are available for large companies depending on their specific requirements. Large companies spend a lot of time and money taking on subcontractors. However, once a contract has been signed, it is very difficult to check the performance of these subcontractors as they have no visibility over the job until it is completed or an invoice is received. Even if the company has their own job scheduling system, they can watch jobs done by their own employees but cannot check those jobs done by subcontractors. AutoAlert has over 18,000 customers using its GPS tracking platform. However, growth is escalating as our customers see the value in connecting to their own customers and suppliers and sharing the status of their jobs. Find out more about AutoAlert GPS Tracking and AutoAlert Jobs and how they can benefit your business. With high fuel charges and not enough time in the day, our customers often ask how they can easily see where their drivers are in order to more affectively allocate jobs. With AutoAlert’s new search function you can easily now search for an address from the radar screen and get a pop up showing that location – anywhere on earth. You can get directions from that location, zoom in and out and most importantly, get your nearest three vehicles by route mileage and time. You can then send the right jobs to the right person, send them messages or directions and combined with the AutoAlert suite of reporting tools, ensure you are minimising mileage and fuel costs and improving your business. Taxis might be taxis the world over but in the Philippines, they’re slightly different. 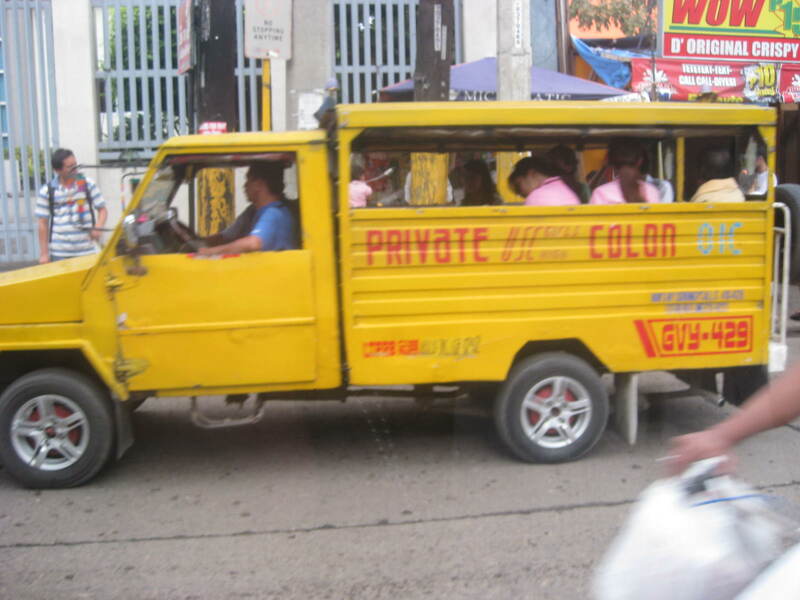 Well, more than slightly, actually, they’re colourful, rather fun looking and called jeepneys. Maybe they’re the Philippine alternative to our people carriers; I wouldn’t mind hopping into one of these whenever I needed to get somewhere. Well, actually, as a London-based vehicle tracking company that specialises in GPS systems, AutoAlert has just won a major new contract with the World Bank on behalf of the Philippine government in Cebu to improve jeepney (taxi) scheduling. So, who knows, maybe I will get to ride around in one of these. Maybe I could bring the idea back home and get the local councils interested. AutoAlert Ltd put forward a tender to the World Bank to develop a system to improve the taxi scheduling and monitoring in the Island of Cebu – and yes, we faced down some tough competition. To my delight, the award-winning technology we have developed convinced the powers that be, we won the contract and have been given the go ahead by the World Bank and Philippine government. It’s great news and the project is on schedule, all going well. The project aim is to prove a proof-of-concept for the use of emerging ICT applications such as crowd-sourcing, open-mapping, alternative uses for mobile phones. AutoAlert is required to work on the mobile phone side of operations, collecting location data from jeepney drivers. This can be used to collect traffic and transit data, plan and manage local transport services for taxi and public transit companies. It can also provide a platform for public participation in the transport system and network development. So far, so good. The Philippines has 89 million people and is the fastest urbanizing country in East Asia which, as you can imagine, has significant implications for transport planning and management,economic, safety and environmental factors. If you think our potholes in the UK are anything to grumble about well, the quality of the roads out there is worse. This has resulted in higher transport costs, accident rates and fuel inefficiency. So hopefully we can improve things for them because the information technology tools needed to ensure accurate, consistently updated data for road asset and transport system management are simply not there at present. This lack of objective data means city planners cannot implement efficient data-driven policy and investment planning. It’ll certainly be interesting to see the positive outcome of this project. Jeepneys, you see, aren’t exactly the equivalent of our taxis. They offer an essential service as the backbone of the public transport network, often comprising more than 50% of the traffic flow. Their behaviour therefore significantly impacts the capacity and safety of roads. So you can see it’s quite an important project and one we’re really proud to be involved with. Happy to hear your comments.